Mirror photo by Sean Sauro / Construction workers use heavy machinery last week off Juniata Valley Road in Frankstown Township. The Mariner East 2 pipeline is being constructed in the area. Construction of a pipeline, which has drawn harsh criticism in neighboring Huntingdon County, is underway in several Blair County municipalities. But unlike in Huntingdon, local construction has not received the same large-scale opposition, municipal leaders said. “I think Sunoco has been very much out in front, trying to get information to the public,” Blair Township Supervisor Palmer Brown said. 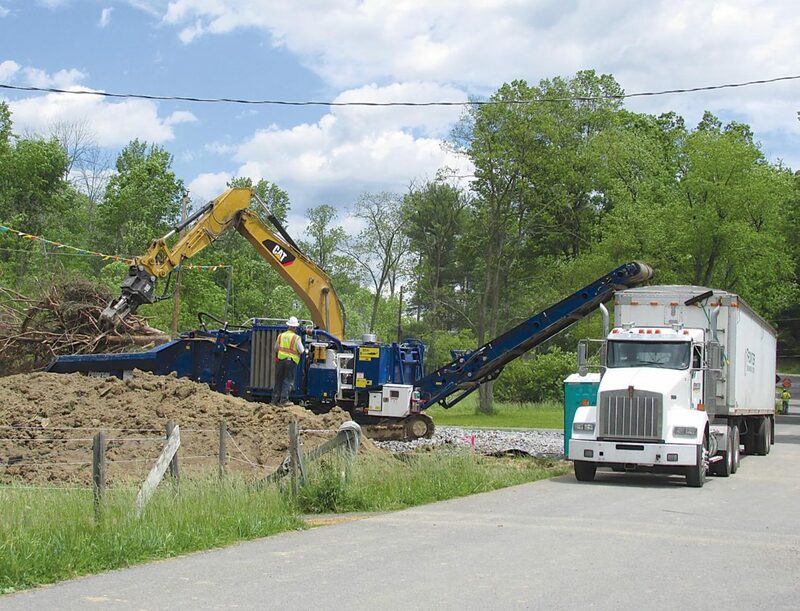 Sunoco employees are working to construct a 300-plus-mile, underground pipeline — the Mariner East 2 — that will carry natural gas liquids from beyond Pennsylvania’s western border to a storage and distribution facility in Delaware County’s Marcus Hook area. Along the way, the pipeline will pass through Blair, Cambria and Huntingdon counties. And in Blair County, it will pass through Juniata, Allegheny, Blair, Frankstown and Woodbury townships. A crew of workers, wearing bright vests and white hard-hats, operated heavy machinery across the road from Nick’s Alternator & Starter Services. Construction began a few weeks earlier, Brown said, explaining the pipeline will eventually cross a portion of his property. Brown admitted construction may be inconvenient, and it has received some local criticism, but he also pointed to the pipeline’s prospective benefits. Similar orange pipeline construction notices could be seen along Juniata Valley Road in Frankstown Township, where crews worked Wednesday at three separate sites. Construction began in Frankstown Township a few weeks ago, Zoning Officer Kevin Cramer said, noting he was unaware of any community opposition. Woodbury Township Secretary Eleanor Harclerode said the same. That’s in contrast to large-scale, anti-pipeline protests in Huntingdon County, where dozens have spoken against construction at public meetings and others have filed lawsuits and climbed trees in attempts to halt work. There, protesters have opposed Sunoco’s use of eminent domain to access land, as well as the potential for environmental destruction associated with a possible spill. Sen. John H. Eichelberger Jr., R-Blair, discussed both issues at a meeting last week, according to a previous Mirror report. Eichelberger told a questioner he supports the use of eminent domain to seize land for private developments, receiving jeers from the crowd. In September, Reuters reported an analysis of government data that suggests Sunoco Logistics spills more crude oil than any of its competitors, with more than 200 leaks since 2010. Sunoco’s Mariner East 1 pipeline has been transporting propane and ethane in the region since late 2014, and it has leaked multiple times — including an August leak in Allegheny Township, officials confirmed. The Mariner East 2 pipeline is being constructed by Sunoco Pipeline LP, which was a subsidiary of Sunoco Logistics. However, Sunoco Logistics recently merged with Energy Transfer Partners. Energy Transfer Partners received some criticism last week after The Intercept reported the company hired an “international mercenary and security firm” to help thwart anti-Dakota Access Pipeline protests, which have attracted much national attention. Those security contractors described pipeline protesters as an “ideologically driven insurgency with a strong religious component” and compared them to jihadist fighters, according to The Intercept report. Locally, Brown said pipeline officials have been receptive to feedback, agreeing to move a pump station away from a residential area and to limit construction to normal work hours. “They are not going to be there all night drilling,” he said.